Q&A with Dr. J: How valuable are the 7 day trial packs that TruVision Health makes? As I promised the followers of my Facebook page www.facebook.com/DrJsHealthcare, I am going to take some of the questions posed to me and answer them in my blog. The following question from Linda, is the first one we will cover. Please keep in mind that this is my personal opinion and not the official stance of TruVision Health. The Q&A thread is still active on my page, so you still have time to leave me a question that you would like me to cover for you. Linda asks, “How valuable are the 7 day trials packs? Great question. The 7 day trial packs were never designed for everyone to lose weight with. They are merely a tool to see whether someone is a good candidate to take a 30, 60 or 90 day course of TruFix and TruWeight & Energy. That’s not to say that many people don’t lose a significant amount of weight while taking their first trial, but I like to under promise and over deliver. The majority of people do experience weight or inch loss during their first week, but in the clinical trials there was a small percentage of people that didn’t lose until the second month. This is simply because a person carrying extra weight has some degree of imbalance. They may have insulin resistance, hypothyroidism, adrenal fatigue, hormonal upset, etc. Hormonal imbalances make it VERY hard to lose weight, but once you correct underlying imbalances, your body can release the weight it has been hanging onto. This process can happen very quickly or it can take a while – it really depends on your personal degree of imbalance. 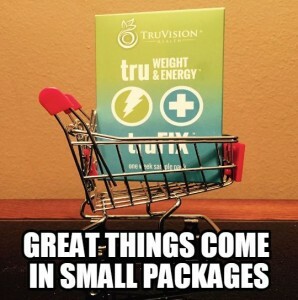 While some people may have experienced immediate benefits, I feel that this type of ‘immediate gratification thinking’ ended up in lost sales and unrealistic perceptions on the part of the customer, because many people felt that if they didn’t experience weight loss or a rush of energy during those few days, then TruVision was not going to work for them and they discounted its use. Copyright (c) 2013, 2015 Miranda Jorgenson. All rights reserved. This material may not be published, broadcast, rewritten or redistributed in whole or part with out the express written permission of the author. You are welcome to share this link or print this page and use in its entirely. 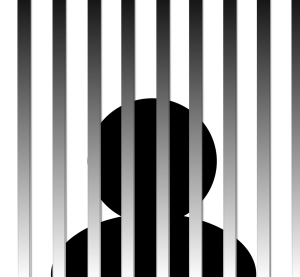 Ever since I joined Facebook, I have had the good fortune to make many new online friends and join several very interesting networking groups on Facebook and now I watch my FB friends waft in and out of Facebook JAIL. Now, it’s not a literal jail, but it is a horrible place to find yourself stuck in either temporarily or permanently . As I type this there are a few different threads going on in the various network marketing sites about Facebook Jail and how to avoid it, but they contain a fair bit of misinformation, so here is my take on what to do and what not to do to stay out of the pokey. 1) Actually READ Facebook’s Terms of Service for both personal and business pages. You can’t play by the rules unless you know them first! 2) Create a business page for your network marketing business. Use it! Your personal page is not intended for personal promotion of any sort. Keep In mind, that Facebook tracks everything. If 99% of your personal page’s posts are about Plexus Slim, Mary Kay, Silpada, Arbonne, or any other product, you are going to get ‘red flagged’. 80% of your personal page’s posts should be personal. Talk about your kids, your tea cup collection, your passion for crocheting outfits for cats — whatever! Just not your MLM. Facebook wants to make money from selling ads, they heavily frown on you selling anything from your personal page. Use your business page to promote to your heart’s content. 3) Quit posting your MLM replicated website! First, no one cares. Second, how many strangers have you ever had just click on your replicated page and buy something? My guess: none. Facebook is a social interaction tool. So be social and interact. If you spam your pages with your ordering information, it only encourages curious people to google the company or product, and they have a much greater chance of finding another representative’s fancy website and buying it from them, or worse, reading a article poo-pooing your product or service (usually planted by your competition). 4) Furthering #3, Utilizing a custom URL is not going to fool Facebook or get around their distaste for replicated websites. Go ahead, type your custom URL into a status update, and the link will show your replicated page. A simple redirected site is not going to allow you to spam. When you create a post on your page, the idea is to engage and interact with your audience. Encourage them to contact you privately for more information. 5) Stop ‘friending’ people you don’t know. Do you recall seeing that new little pop-up on Facebook asking you how you know this person? If they click ‘only through Facebook” or that they ‘don’t know you’ then you just earned a ticket to FB jail. No one is sure how they calculate how many of these ‘Go -to-Jail’ tickets you need to collect before you get a minimum two week time out, but you just don’t need to be sending friend requests to people you don’t know. If you participate in a group with someone that you don’t know personally, but would like to follow, then make sure you send them a brief introduction on what group you have seen them in, our shared interests, and why you would like to friend them. On a similar note, clean up your friend list. Remember those bitchy people from high school who didn’t like you then? Guess what? They still don’t like you. If you have antagonistic people on your friends list, get rid of them. These are the people most likely to report you for spamming. Also, when it comes to friending, don’t go on sprees where you add 40 people in a single day. Spread out your requests over time. 6) Don’t make your cover photo an advertisement for your product or service, and don’t use it to direct people to your business. Remember, business is business and personal is personal. 7) When you do put together a post, don’t copy & paste it to several different pages or groups in a short period of time. Make each message different, and be aware that Facebook utilizes complex algorithms to determine how long it should have taken you to put together a post and then navigate to another page. This number has varied over time, but don’t post more than once a minute. Period. 8) When you do post a link to your URL or if you are posting a link to any non-Facebook site, use short links (bit.ly, goo.gl, wp.me, etc.). Long URLs can trigger red flags, and a visit to the Facebook slammer. 9) Don’t promote your sales on anyone else’s page unless you were specifically asked to. It is rude, and it is spam. This carries over to sites other than Facebook too. I frequently see a sales rep or ambassador posting a nice thread or blog about something, then when I scroll down to the comments section I see no-good snipers pitching their wares on the author’s page, telling the audience to contact them for more info. It reflects poorly on you, on your product, on your company, and it is really, really bad karma. 10) Don’t be creative with your personal name. Unless your name is actually Cindy BODYBYVI Stanley, don’t put the name of the company you represent in your official Facebook name. Big red flag. Scratch that — HUGE red flag. So, there it is in a nutshell. Go forth & prosper, and stay in the good graces of Facebook. They are second only to Google in traffic, so you don’t want to get banned for something you easily could have prevented! 1. My ultimate ‘secret weapon’ is Muco coccinum. I was turned onto this supplement 9 years ago by another doctor, and we have used it with our family and our patients ever since. One year I waited too long to order my supply and it got sold out. Lesson learned! I now order early to make certain that I secure my supply for my kids , myself, my patients, and clients. 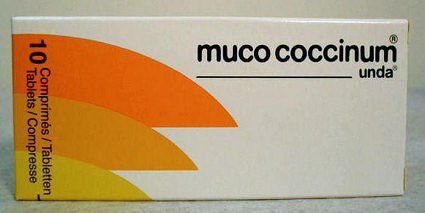 Muco coccinum is a homeopathic preparation comprised of homeopathic preparations of four of the worst strains of flu seen in the past century: Influenzinum 200 K, Klebsiella pneumoniae 200 K, Branhamella catarrhalis 200 K, and Micrococcus tetragenes 200 K. For those of you unfamiliar with homeopathy, it is a system of alternative medicine developed in Germany over 200 years ago based on the principle of ‘like treats like’. Extremely diluted preparations of natural substances are prepared using specific ratios and delivered in liquid or tablet preparations which you dissolve under the tongue. Muco coccinum is made in Belgium, but I import a supply from Canada each year. It was designed to boost immune function and stimulate the body’s own defenses to combat or prevent symptoms associated with flu and other seasonal viruses. In studies it has been shown to be 88% effective in the prevention of influenza and 82% effective in the treatment of primary flu-related symptoms of chills, muscle aches and minor fever. So, if taken as recommended, most people find that they simply do not get sick, but if they are exposed to a virus, they have fewer and less severe symptoms and recover faster. The key is to take the product regularly. It is recommended that you dissolve one tablet under the tongue every two weeks. If you know you have been exposed to a contagious person, you can take an additional dose as soon as possible as an extra preventative measure. A box of 10 tablets will last a person for the duration of the flu season, if taken every two weeks from late October through March. Please note, that particularly susceptible individuals such as children and seniors can take one tablet every week for prevention. Another unique feature about Muco coccinum is that if you haven’t been able to take it preventatively, and you are already starting to come down with symptoms of the flu, you can take it to lessen those symptoms. Simply dissolve one tablet 2-3 times per day until the package is emptied. 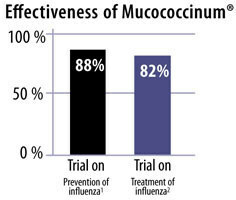 Muco coccinum is a safe and natural way to prevent symptoms and guard you and your family against the flu. With over a million doses sold each year, the country of Belgium has been using this successful remedy for many years. It is now become available in North America. This oral medication is considered a safe and effective alternative to the influenza vaccination. Auto-immune disorders and pregnancy. Muco Coccinum is not indicated for pregnant women due to a lack of research on its safety for pregnant woman by the company that makes this product. Homeopathic remedies do not have the actual molecular ingredients that are used to make these products, as they have been diluted down to such a level that the original substance is no longer detectable; it is the energetic quality of the substance that remains. Though those energetic qualities do move the body to build up it’s immune response antibodies, so those antibodies can recognize and react to these flu strains in this product if you are exposed. Non-Medicinal Ingredients:Xylitol (from birch or beechwood), Magnesium stearate, Lactose (from milk). Note: As with any homeopathic treatment, it is not advisable to eat, drink, or consume products containing mint (ie. Candy, chewing gum, toothpaste, etc. ), or to use products that contain menthol, camphor, or eucalyptus (e.g.- Tiger balm, Ben-Gay, mentholatum, etc.) within 30-60 minutes of using a homeopathic. These products can antidote the medication, so do not use them around the time of taking mucococcinum. *** Muco coccinum is part of a physician only nutritional line, so be very careful where you are buying your supply from. Neither I nor the company authorize or recommend online sales. Buy from a doctor that guarantees that you are receiving fresh product that hasn’t been exposed to potentially damaging shipment conditions, heat, light, etc. As of today, I still have a limited supply of Muco coccinum at the office, so contact me if you would like me to reserve it for you. 2. Use a humidifier! Coughing and sneezing spreads germs and viruses, and studies have shown that the less humidity in the air, the further those bacteria and viruses can spread. Many physicians have even speculated that the real reason we have a cold and flu season, is because of the fact that we are cooped up in closer quarters and bacteria and viruses thrive in the drier indoor air resulting from popular heating methods. Not only do these nasties live longer in dry conditions, but they can rapidly spread on air currents effectively contaminating entire rooms in mere seconds. By placing humidifiers in your living and sleeping areas, not only can you alleviate symptoms of colds and flu if you are already sick, but you can thwart their spread to other members of the household, and even prevent certain bacteria and viruses from being able to take hold in sensitive lung tissues. If you have small children, make sure you place the humidifier at a safe distance so they do not burn themselves. 3. 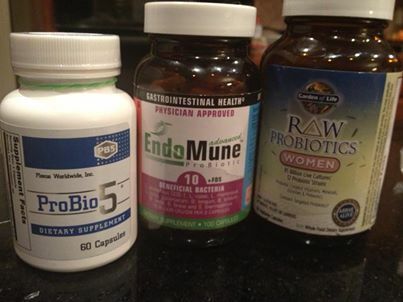 Take your probiotics. It has been said that over 80% of your immune function originates in the gut, so support your immune system by taking a potent probiotic blend. I am very pleased with ProBio5, and I rotate other broad spectrum probiotic blends in my household to boost immunity to optimal levels. 4. Wash your hands frequently with good old fashioned hand soap. Do not use anti-bacterial soap or hand sanitizers, use of either of these has been associated with increased risk of cancer. 5. Use peroxide. If you have been exposed to someone who is coughing, sneezing, or otherwise presenting as ill, swab your ears out with a cotton swab soaked in hydrogen peroxide as soon as physically possible. I learned this trick from an old Doctor of Osteopathy, who premised that many airborne germs enter your system via your ear canals since your nose and mouth have other protective mechanisms to prevent infection. I started swabbing my ears our after any air travel several years ago and cut my incidence of getting sick after flights dramatically. 6. Load up on raw fruits and vegetables. Fresh fruits and vegetables are chock full of valuable nutrients and enzymes that boost your immune system and help it resist infections. 7. Eat your soup! 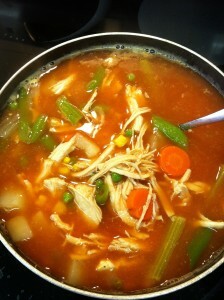 Grandma knew what she was doing when she made you eat homemade chicken soup when you were feeling ill. A few different studies have now confirmed that not only does chicken soup possess anti-inflammatory benefits, but it also affects the mobility of certain types of white blood cells which make it particularly effective at helping with chest and sinus infections and symptoms. Make sure to use bones when you make your broth and include plenty of onions (source of quercetin) and herbs (source of a variety of anti-inflammatory compounds). 8. Drink Green tea. A recent study showed that regular green tea drinkers had 69% less chance of developing the flu vs. non-green tea drinkers. 9. Supplement with Vitamin D. Most clinical studies in the past decade conclude that the RDI is woefully inadequate, and believe that 3000-10,000 IU/day of Vitamin D is an optimal dose. I recommend cholcalciferol (D3), not ergocalciferol (D2). I attended a medical conference a few years back in Cincinatti, and one of the lead researchers on vitamin D proposed that nearly all doctors are dosing vitamin D incorrectly. She said that our current practice of only dosing in the winter months is opposite how we understand vitamin D uptake to work. Since vitamin D synthesis and uptake is circadian and based on the wavelength of sunlight, she proposed that we dose heavily from mid-Spring to mid-Autumn (when the wavelengths of sunlight are the longest) and only take a maintenance dose over the winter months. 10. Get out and exercise. Spinal movement is essential for maintaining health, and regular and consistent movement of your quadriceps is the best lymphatic pump in your body. A simple walk each evening for 20 minutes or so after your meal will do wonders for your overall health and immunity. Deep breathing associated with moderate physical activity also helps to clear the lungs of mucous and foreign substances. 11. Increase your protein intake. High quality protein and whey protein are both valuable sources of proteins and amino acids such as argenine help the body make lymphocytes and T-cells that dramatically improve your immune function. Plexus 96 is a great, portable source of whey protein, and an easy way to add it to your diet. Also, studies have shown that the nutrients in whey protein give your body all of the building blocks it needs to increase its glutathione production, one of the best markers of health. 12. Don’t make a habit of popping acetaminophen or ibuprofen at the first sign illness. These not only tax your liver or kidneys, but artificially lower your body’s natural response to defending against colds or flu (fever), which can dramatically increase both the intensity and the duration of your cold or flu. 13. If you have low or altered immune function, consider taking desiccated thymus gland concentrate. This supplement is another ‘hidden gem’ at boosting overall immune function and helping you ward off seasonal nasties. 14. Visit your local chiropractor. Spinal adjustments have been shown to stimulate immune responses, and as the old adage goes, an ounce of prevention is worth a pound of cure. Network Marketing 101 – Do these steps and become a Master! So, you have signed up to for your own network marketing business, or perhaps you are just investigating companies because you want a low-overhead way to earn a second income for yourself and your family. Either way, you are in the right spot! I have been involved in sales and marketing all of my life because it was my family’s business. There are certain things that hold true regardless of the line you are part of or the company you promote. Undeniably, there are certain factors that distinguish the people that wish from the people that do. Not everyone is cut out for network marketing, but if you commit to it and put in concerted effort – you can’t help but succeed. It will take time, it will take effort, but the rewards are innumerable. What I write can be applied to any type of sales, but I am specifically directing this post to network marketers. If you want to be successful, the #1 most important thing you can do is to treat your network marketing business LIKE A BUSINESS. It is often quoted in this business that if you treat it like a hobby, you will get paid like a hobby. If you treat it like a business, you will get paid like a business. Quite simply, you have to earn your stripes. Nothing is going to fall into your lap. Your entire success is not held with your upline, the town you live in, your social circle, or anything other than YOU. There is no other industry in which you can create your own business with such a small investment or overhead cost. The nature of network marketing allows you to dictate how much time you dedicate to it. You can easily start your business while you are employed elsewhere, and transition to that point where you can FIRE your boss once you have replaced your 9-5 income. So what are these distinguishing factors that I mentioned above? 1) You must work the business. Dedicate specific time to it on a daily or weekly basis. Physically schedule your business development time onto your calendar. Do not settle for distractions, and don’t brush off this time commitment! The more time you are able to dedicate to your business on a regular basis, the faster you will grow. Be prepared with business cards, brochures, flyers, a website, and/or samples. Keep these on your person, in your bag or purse, and in your car. Never be caught unprepared. It will cost you business. 2) Be a Product of Your Product. What does that mean? It means you have to LEARN about your products. Be an EXPERT about your products. USE your products every day, and BELIEVE with 100% conviction that your products are the best. If you can’t LEARN, USE, or BELIEVE in your products with complete conviction – then you have the wrong product and you will not succeed. 3) Share don’t Sell. No one enjoys being ‘sold’, but people do enjoy when someone takes time to share with them something that they found useful or helpful. If you have 100% conviction that your product or service will help a person, then it is your obligation to share it with them nicely. It can be hard to not be over zealous in your approach, but remember how you feel when people have tried too hard to convince you of anything – it turned you off entirely! I like to tell my children that “you are not listening if your lips are flapping”. The best sales people LISTEN to their potential customer and SOLVE A PROBLEM that exists. To be blunt, if you are talking more than your prospect – then you are tuning out what they are trying to tell you. If you truly listen to what they say, they will tell you exactly what you need to say or do in order to sell them anything. 4) Create an online presence and utilize social media to build your business. Post interesting information on a very regular basis. Every post can’t be a link to your ordering page. If you do that, you will quickly lose your circle of friends, and everyone will tune out your message. Worse, sites like Facebook will recognize you as a spammer and freeze or cancel your account. The people who do the best with social media position themselves as experts. They post pertinent information that people will find interesting. They are ambiguous about what they say. They leave their audience wanting more, and they leave the door open for people to contact them through private messaging to learn more. Successful network marketers CONTROL, LEAD, & DIRECT their potential leads. 5) Utilize your upline and/or find a mentor. Everyone who operates and succeeds at a high level has a coach or mentor in their life. Period. If your direct upline is not successful, go to the person above them, or the person above that. It is up to you to reach out and connect with that person and create a success network for yourself. If your team is non-functional, find a coach or mentor who is willing to work with you. This is crucial. Schedule a brief phone meeting with them on a weekly or every other week basis. Have them hold you accountable. Do not skip this step! They have been where you are, they have discovered solutions to the obstacles you are facing. There is zero reason for you to reinvent the wheel. Always ask for help when needed! 6) Follow up. Reach out to your customers on a monthly basis at a minimum. Make it brief but personal. Let them know that you are there for them and wish for them to have the best possible experience with your product or service. Reward them for their referrals, and remind them that you reward them for their referrals. Do the same with your team members. Reach out to them and help them with their obstacles. Always keep in mind that if your team is successful, you will be successful. It is your obligation to do everything in your power to help them succeed. All of this follow-up requires tracking. If you are computer savvy, create a file for each person to track what you have said or sent to them. If you are old school, create a binder system and make a page for each customer or team member. 7) Set goals & write them down! The old adage ‘if it isn’t written down, it didn’t happen’ is especially true when it comes to goals. Go buy a small journal or poster board and write down your goals. Be as specific and detailed as possible. Use emotion words. Use present tense. “I will take my children to Disney World when I earn $3000” or “I will pay cash for my son’s braces” is much more powerful than “I want to be a millionaire and sit on the beach drinking daiquiris all day”. “I am ___” statements are even more powerful! Review your goals on a regular basis. Make a vision board if you are a visual person. Celebrate your goals when you have achieved them, and make attainable goals so you maintain your mental excitement. Set both short term and long term goals, and reevaluate these on a regular basis. 7) Educate yourself. The most successful sales people and network marketers that I know all dedicate time to bettering themselves. This means reading books from authors who have made their way to the top. It means listening to coaching or empowerment CD’s in the car. It means sitting in on webinars and conference calls learning how to improve what you do. If you recognize that there is always something more to learn, then you are half way there. Cocky people think they know it all. Wise people recognize that there is always much more to know and master. Success is yours for the taking! Are you willing to embrace it? Dr. Miranda Jorgenson maintains a private practice in Louisiana, is an entrepreneur and nutritional coach. Copyright (c) 2013 Miranda Jorgenson. All rights reserved. This material may not be published, broadcast, rewritten or redistributed in whole or part with out the express written permission of the author. You are welcome to print this page and use in its entirely for limited, non-commercial purposes. Do not post to other sources.